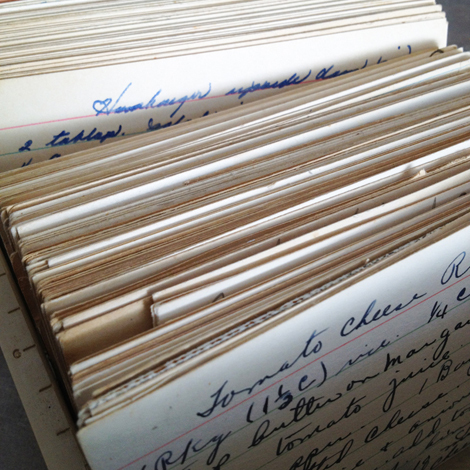 I’ve been playing with vintage recipe cards from my collection again! 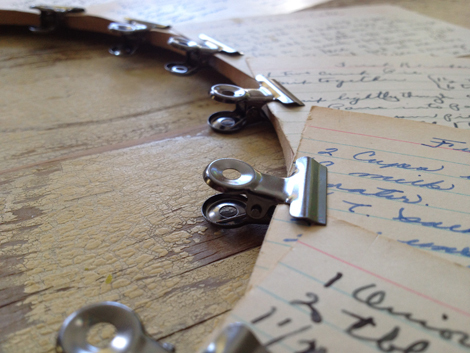 The first project is a super easy one that you can craft using your own cherished recipe cards without any damage to them. 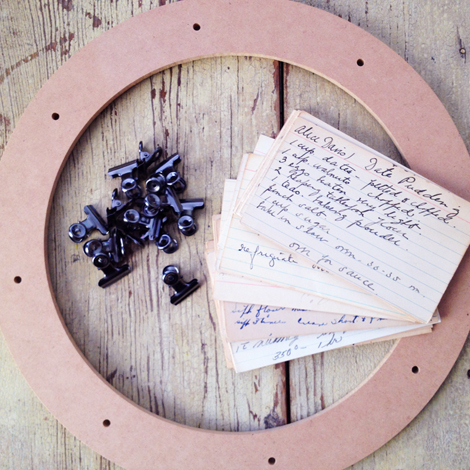 With a few cards, a wreath form and tiny hinge or bulldog clips, those hidden treasures become sweet decor. Head over to my post on SC Johnson’s Family Economics for the step-by-step directions and final wreath image! 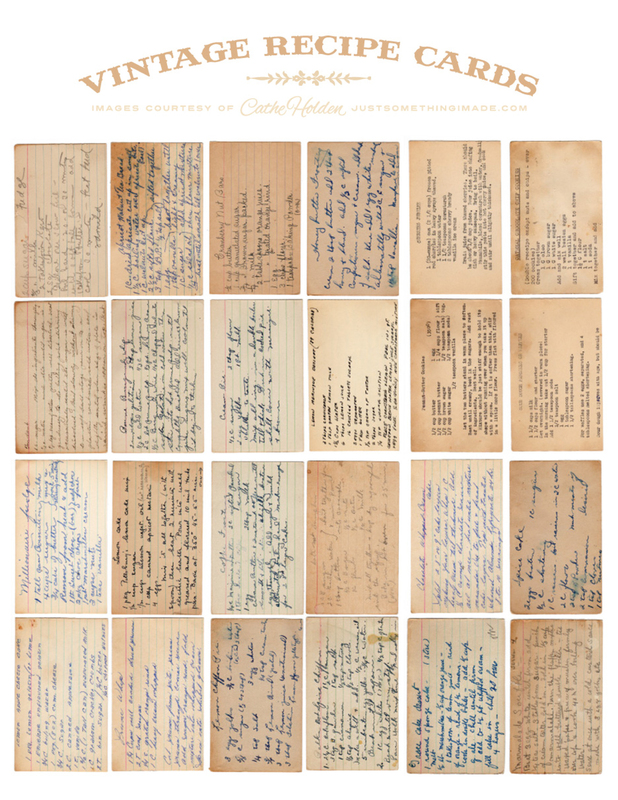 While I had my recipe cards out to make the wreath, I scanned them into my computer and created a FREE printable of mini vintage recipe cards for paper crafting and scrapbooking. Simply download the image (click to enlarge), print to letter-size cardstock and trim out the individual images. Use a light brown marker to color the cut edges of the cards for the best visual effect. 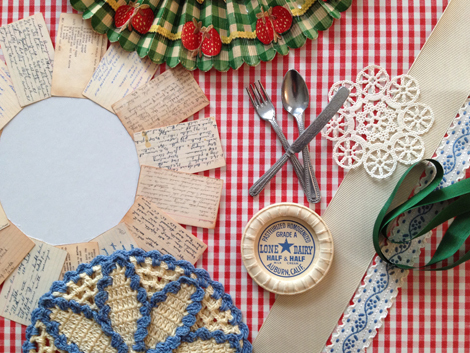 I fanned my little cards around a round piece of cardstock (a large circle cut from a paper plate,) and combined that with some other fun items: Acordion folded vintage shelf paper, a vintage crocheted trivet, the center cut from a paper doily, doll utensils, a milk bottle cap and coordinating ribbon and trim. 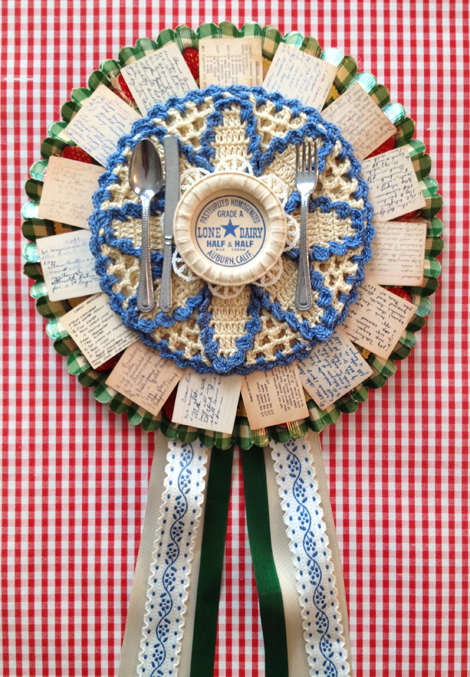 And here’s what I made- a cottage kitchen rosette! This entry was posted in Family Economics, Free digital collage sheets, Free digital downloads, Free Jpgs, free vintage art, Paper Crafts, SC Johnson, scrapbooking, Vintage Ephemera. Bookmark the permalink. Oh my gosh, I could not love it more! That is absolutely adorable! I’m always amazed at your creativity! Wow, you are always surprising me with great ideas!! Thanks for sharing! Love it! Those miniatures all look so real, especially the doll utensils! so cute, what a great idea and fun decoration! I just adore all the rosettes you make! I want to try my hand at some but I’m not sure they will come out to be anywhere near as cool as yours! Chanel handbags are produced away from your finest leathers, silks and fabrics so the excellent is obviously reflected in every solo and every solo and every Chanel hand bag. Chanel handbags are versatile which allows it to go just about anywhere. This is such a beautiful idea…love yours and can’t wait to try this. Thanks so much for sharing the cards. Hey! This is very VERY cool!!!! Oh my goodness. You are adorable. This post kept getting better and better as I kept scrolling. Keep it up! 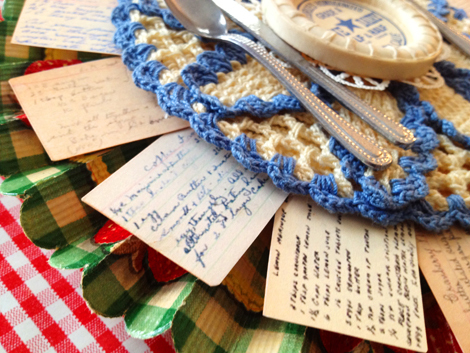 I love your project and the use of the vintage recipe cards. I absolutely love vintage recipes and the cards they were written on. They remind me of my grandmother!Would it be possible to get the full recipe for the Cranberry Nut Bars from the recipe card you used in the free vintage recipe card printable? I have been searching for the recipe for them and cannot find one similar to this one! thank you for making the recipe cards available. I stumbled onto them while on Pinterest. They are well done. In fact, it brings back so many memories from childhood when I would help my late grandmother in the kitchen. They look just like her cards…down to the handwriting. I never thought a free download would make me emotional. I obviously miss my Nana. So know you freebie means the world to me. These are just awesome Cathe. Thank you so much. I am going to add them to my Recipe Scrapbook that I am making for my kitchen. These will be such a nice little additions to it…Your amazing!!! Cathe,,I just love your site !Love all your vintage and thanks so much for sharing ! !